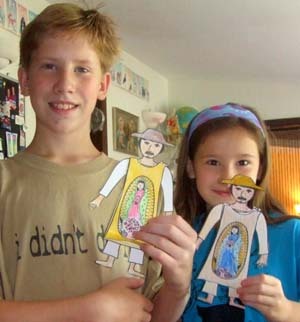 Many of you know we have chosen St. Juan Diego as patron of our 2009-2010 homeschool year. Last week, Cro and Aud made Juan Diego paper dolls. His tilma is removable, so you have a Juan with and without Our Lady of Guadalupe. There is a nice cluster of roses as well. This wonderful little project is a free printable at Paper Dalis. In addition to a nice selection of saints, they also have quite a variety of historical dolls. Oh, what a fun surprise to see my paper dolls being used! How cute is that? May I borrow the pic for my site? (I’ll link back to you, of course!) He’s a good patron to have, humble and obedient Juan Diego … whom our Lady addressed so gently. Veronica, please feel free to use the pic. We really enjoyed making your St. Juan Diego and would absolutely love to have Guadalupe, the Bishop, and Juan’s uncle to go with him. I love all your paper dalis! Just looking for the right opportunity to integrate them with our coursework. I edited my links to the one you provided. Thanks! And, thanks for all you do. Your creative work is greatly appreciated!